The nightmare started when the window manager I was using (metacity) abruptly stopped working. 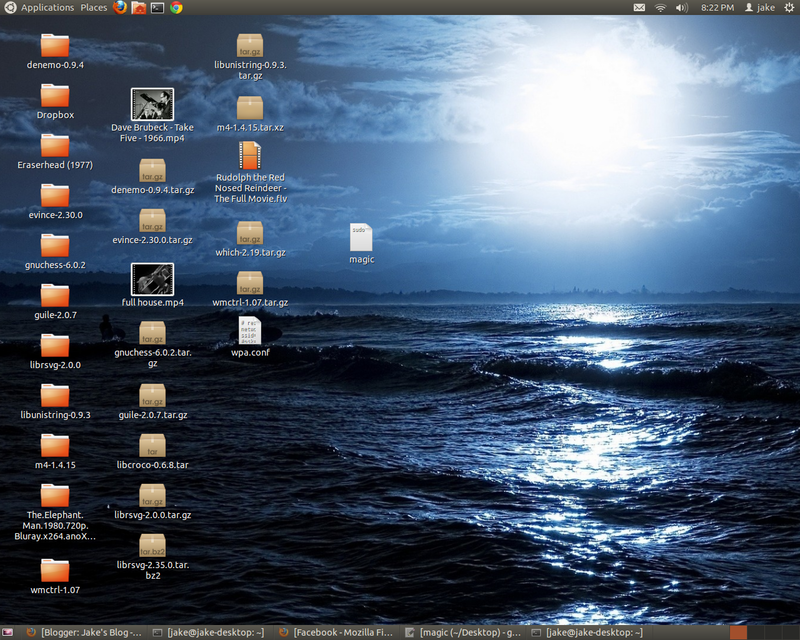 I rebooted and then found that the display manager (gnome) also was not functioning properly. Every time I booted up, I was just greeted by the default Lucid background. Although I could move my mouse, the login screen was nowhere to be found. To test my connection I would try using "ping www.google.com" to see if I got back anything. I then tried the command "do-release-upgrade". This calls a python script which initiates the upgrade to 12.04. I ran into the exact same issue as described here: http://ubuntuforums.org/showthread.php?t=1767358. I had multiple versions of python installed. I simply moved the GnuPGInterface module from the version that had it installed to the version that the script was using. The script now worked fine. It turned out I wasn't out of the woods yet, not nearly. About half-way through my upgrade, my internet connection went down. When this happens the entire script must fail before I can start back where it was on the download. With my RT2500 usb adapter I have always had issues with it frequently losing its connection inexplicably. I miss the days when I could have a wired connection but sadly those days are, for the time being, no more. To reconnect, after waiting for the script to fail, I simply repeated the wpa_supplicant and dhclient commands as before and then retried the upgrade python script. After repeating this exercise several times (*sigh*), my system finally booted up with 12.04, and alas I could finally log in again! I slept well that night and my time spent at my day job went by quickly. I was confident that the nightmare was over. When I got home from work and tried using the internet I was greeted by a slow connection speed reminiscent of the old days when I used a dial-up modem. A page such as facebook would take up to several minutes to load and a typical download speed would range from 50 kb/sec to 100 kb/sec. As per the usually I would frequently have to unplug and replug in my wireless adapter to maintain this horrible connection. After losing another day to this issue, and almost losing hope, I inadvertently stumbled upon my solution here: http://askubuntu.com/questions/131768/dlink-wireless-dwa-140-speeds-are-crippled-on-12-04. It turned out that the wireless power management on my system was crippling my internet speeds. It may also have been the primary cause of my dropped connections though that remains to be seen. Thus after entering the command "sudo iwconfig wlan0 power off", my internet speeds were better than ever and I have also yet to see a dropped connection. Although a lot of forums seemed to recommend editing your connection to ignore ipv6, I didn't see any improvement through this. Here is a technical article I found that discusses some of the basics as to why power management can be so detrimental to wireless performance: http://www.techrepublic.com/blog/networking/wi-fi-power-management-road-warriors-beware/533. Anyways, I hope this saves some time for another poor soul out there on the www that may have to deal with some of these upgrade woes. Hopefully time will prove that the upgrade was worth the trouble. Some may ask why I go through all of this when I could just run Windows and be done. Being a proud Linux user, it's hard to give a short answer to this question. It is hard not to see the value in free software. I am thankful for the many fellow Linux users who would agree with me. Putting aside the whole "richard stallman"-esque argument of how we must fight the evil corporations who are trying to take over the world, it is extremely important for me, as a hopefully soon-to-be-successful software developer to have the utmost control over my own computing. I want to understand how the software I use runs as much as possible. My hope is that with each day I will get closer and closer to that ideal. 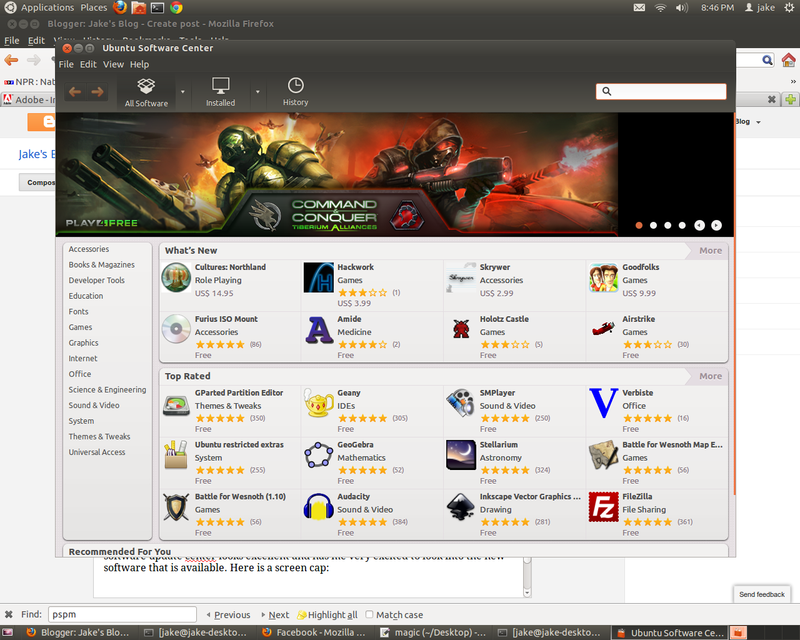 Using Ubuntu, the most supported linux OS, is the least I can do toward that end. And as a computer hobbyist, a project I am planning to start on soon is to build my own customized OS.